John Aitken waits out the future - and the choice of a superintendent. By the time the current week is out, the 23-member Unified School Board of Shelby County will have publicly wrestled once more with the vexing question of who is to lead the educational system which, somewhat more than a year from now, will formally succeed and replace the two side-by-side systems of Memphis City Schools and Shelby County Schools. Aitken's contract had been extended to 2015 by the erstwhile SCS board, and the Unified Board's decision last week against non-renewal of that contract kept alive the prospects of the SCS superintendent to manage the combined system — especially as that system will technically be a continuation of Shelby County Schools. The word "unified" in the provisional name of the provisional governing board is ironic in the extreme. First of all, the board is one of those proverbial camels put together by a committee — assisted in this case, by a judge, U.S. District Judge Samuel Mays. It was Mays whose adept handling of several overlapping litigations last summer induced numerous warring jurisdictions — educational and civil, urban, suburban, and state — to agree on a compromise regarding city and county school merger that became the basis for a consent decree. Strictly speaking, the board is composed of the nine members of the former Memphis City Schools Board, the seven members of the former Shelby County Schools (suburban) board, and seven members appointed late last year by the Shelby County Commission to represent the seven county-wide districts recognized in Mays' consent decree. In a little over a month, on August 2nd, the county's voters will select permanent members for those seven districts, which the County Commission intends to enlarge to 13 eventually, if Mays should agree. Those newly elected members won't take office until the merger date of August 2013, however, although they might be permitted to take office earlier — again, under dispensation from Judge Mays. But all of that is another story. Right now, it is the highly fractious "unified" board which governs and, after six or seven months of desultory existence, has finally got down to the nut-cutting stage. Whatever Kriner Cash's critics might think of him or of his often flamboyant and arguably over-bureaucratic four-year reign, the MCS superintendent comported himself with dignity last week, as 22 members of the Unified Board (absent only the ever-volatile Rev. Kenneth Whalum of the MCS contingent) wrangled for hours over his status. For the most part, Cash — who sat between Aitken and MCS holdover Martavius Jones, a onetime critic become Cash defender — betrayed no emotion and remained Buddha-like as discussion went this way and that — sometimes indirectly, sometimes all too bluntly — regarding his status. And none of this was happening in a vacuum. Outside the Teaching and Learning Academy building on Union Avenue, where the board was gearing up for the first "showdown meeting" on the superintendency last week, others had taken sides. Chanting and carrying placards on the front grounds of the building, a large group was supportive of Aitken's candidacy. The Aitken boosters were opposed by a smaller group, led by the Rev. Isaac Richmond, who was attempting to prevent the board from hiring the current Shelby County Schools superintendent (whom they identified on pass-out materials last week as "Robert Aitken," a gaffe that prompted John Aitken to jest that his "cousin" Robert was indeed, as the handouts proclaimed, "unfit" to head the school board. In preliminary proceedings as the meeting got underway, Aitken (whose contract, along with that of Cash, was destined for review) demonstrated perhaps an unintentional sense of irony by announcing a weather-oriented awareness program for students entitled "After the Storm." That was, of course, before the storm, which began to roil after the announcement period, with a proposal from member Jeff Warren to postpone voting until the current week, when the subject would be whether to conduct a candidate search or adopt some other method. Then the clouds began to rumble good and proper, with a variety of possibilities being proposed. 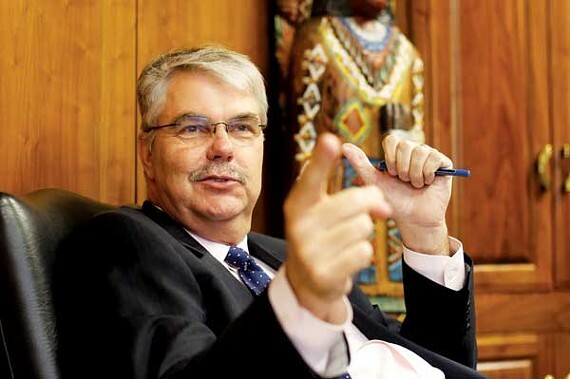 It brought to mind remarks made earlier in the day to the Memphis Rotary Club by Shelby County mayor Mark Luttrell. Asked after a luncheon address if John Aitken was the logical choice, Luttrell acknowledged the SCS superintendent might have a slight advantage but said that both current superintendents were still eligible. Two other possibilities he suggested: hiring from within and hiring someone with executive ability from the larger community. Clearly, Luttrell was not in favor of a prolonged search, nor one beyond the county's borders. But others were. Sara Lewis, ex of the MCS board, had a colorful metaphor in favor of a search process. "Unless I go outside in the parking lot, I don't know what's out there." "I believe this is the defining moment on this board. The issue is, who is going to lead?" Pickler said. Ultimately, the board voted to defer action on hiring a superintendent or on a search process to that end until this week. And then, already several hours into the meeting, came a motion from SCS member Mike Wissman, who doubles as mayor of suburban Arlington, one of six municipalities actively contemplating a breakaway from the Unified System. Wissman called for "the hard vote" on Cash's status. Delayed by almost another hour of wrangling, it came, with the aforementioned 14-8 verdict against Cash, followed by the same totals to keep Aitken's status active. In general, although there were exceptions both ways, former MCS board members voted with Cash and former SCS members voted against him. What made the difference was that the seven commission appointees on the board voted 6-1 against Cash. The Aitken boom began several weeks ago as several key individuals across the spectrum of interested parties — various columnists, a sizeable contingent of the TPC, and likely Luttrell among them — began to view the SCS superintendent as someone who could (if anybody could) reconcile the wary residents of suburbia to the idea of a merged all-county educational system. It is by now taken for granted by almost everyone that the August 2nd referenda in favor of establishing separate municipal systems will be overwhelmingly approved in the six cities in which they will be held — Germantown, Collierville, Bartlett, Arlington, Lakeland, and Millington. Proponents of that outcome, like Pickler, a candidate for the Unified Board, have made it clear that they, too, see Aitken as the ideal superintendent of the new unified district, someone suburbanites would feel comfortable with in negotiating for shared services for their districts. Those two sources of support for Aitken, from opposite ends of the stick, would ordinarily have seemed to ensure his selection. But it was never going to be easy, as some racially charged opposition from within the inner city, typified in that Isaac Richmond circular, made clear. And there's another, larger context. The selection of a school superintendent for Memphis' future unified district is bound to get some national attention. For one thing, what Memphis City Schools and Shelby County Schools are undertaking is the biggest school system merger in American history. There are much bigger school systems, but this is the biggest merger because both systems — Memphis with roughly 103,000 students and Shelby County with approximately 46,000 students — are sizable. That fact alone has drawn the attention of The New York Times and other national news organizations. Second, as indicated, the story comes with both a racial angle and a city-and-suburban angle. Those themes are catnip to national news editors who from time to time see Memphis and Shelby County as a microcosm of social change in America. And third, the selection of a superintendent will put a single face on a complicated story that until now has had many faces — among them superintendents Cash and Aitken and school board members Pickler, Jones, and Tomeka Hart (Jones' partner in furthering the late 2010 MCS charter surrender that forced city/county school merger, and now, largely on the strength of that, a congressional candidate). Involved in the saga, too, are the concepts of consolidation, municipal school systems, and special school districts, all of which have both statewide and national relevance. The person chosen as superintendent will immediately become instrumental, too, in the transition (or "migration," as the Transition Planning Commission calls it) to a new era of innovative educational change. When the TPC was created as an adjunct of the Norris-Todd Act of 2011, it was widely regarded (like the act itself, which lifted a state ban on new special or municipal districts as of August 2013, the merger date) as part of a suburban defense against consolidation. But the 21-member TPC, though appointed with preponderantly suburban input, proved to be a harmonious, utterly sincere and hard-working group which emerged with a plan, called Multiple Paths to Achievement, that is based on the assumption of a countywide system of 150,000 students but allows for maximum diversity. That diversity involves not only the pre-existing MCS and SCS systems but creations of a reform-minded state Department of Education under Governor Bill Haslam. These include a whole panoply of new charter schools; an Achievement School District, which will take over administration of failing schools, many of them in Memphis; and an Innovative School District, designed to upgrade the status of better-performing schools. And more is yet to come, including the resolution of how new municipal districts might interface with the unified district. Not since the twilight of Willie Herenton's career as Memphis superintendent in the late 1980s has such attention been focused on the school system and the question of leadership. Herenton, by the way, said last week he would make his preference known for the current job at a later time. For the time being, it was still the 23-member provisional unified board which had the decision to make on a choice for superintendent. If Aitken should become that person, expect to see and hear a lot of him for the next three years. John Aitken, all 6' 9" of him, ducks under a doorway, takes a chair next to a wooden Indian, and welcomes the visitors into his office. It's been a hectic week, but the SCS superintendent is relaxed and joking about his office memorabilia. "That's Big Chief," he says, hooking a finger at one of the two cigar-store Indians that occupy corners of his office. "There's no special significance. I think one kid once called me chief." 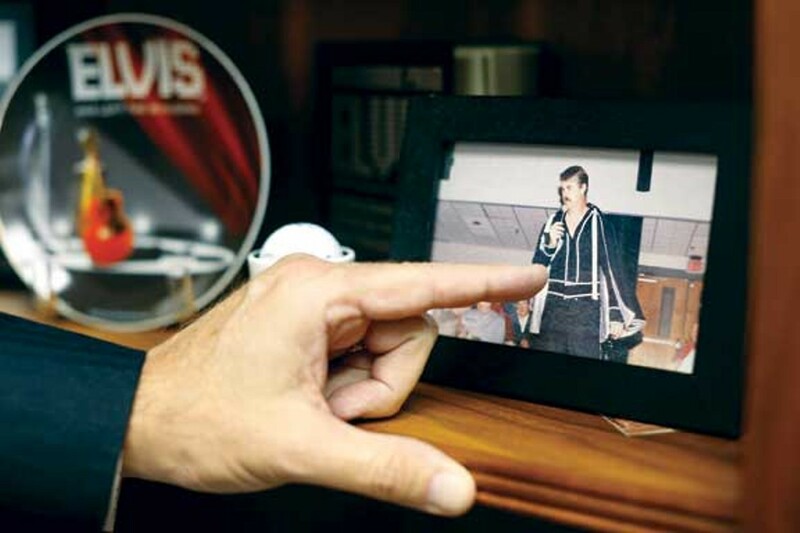 There are pictures of Aitken in Elvis costumes that he wore when he performed at the employee appreciation picnics. In March he sang "Sunrise Sunset" at his daughter's wedding, somehow getting through the tear-jerking lyrics ("Is this the little girl I carried ... When did she get to be a beauty?") before giving her away at the altar. "That was tough," he says. Aitken's current predicament is tough in another way — having to do with the uncertainty of things. The events of the meeting earlier in the week would seem to give Aitken a leg up, unless the board opts to do a search for another candidate. Aitken says he and Cash are friends and talk on the phone nearly every day and meet face-to-face a couple times a week. Aitken says if he does not get the top job, he would be willing to work as an assistant. Though he is every inch the education professional, Aitken exudes the common touch. He and his wife, a nurse in a neo-natal intensive care unit, have two sons and a daughter ranging in age from 23 to 32 years old. The younger son, a special-needs student, is adopted. Aitken's father worked at a lumber mill in West Helena and his mother was choir director at the local Baptist church. He got a basketball scholarship to Henderson State College in Arkadelphia, Arkansas. After graduation, he taught and coached for three years in Arkansas and for nine years at Collierville High School ("primarily basketball, but you end up coaching everything"), then moved to Houston High School in Germantown where he was principal. He was named superintendent of Shelby County Schools in 2009, a year after counterpart Cash came to MCS. He is sympathetic regarding Cash's ordeal at that week's board meeting. "I hoped that everybody kept that in mind, the human element. I admired him for sitting there. It's hard, it's tough on me." Whoever gets to be superintendent of the unified system will have it tough, too, he knows. "I don't know if there's a superman out there who's got everything that job requires. You'd have to bring in some folks around you with a variety of skills." Aitken is prepared to do just that, but he also believes that he owns "some qualities that can inspire and heal and encourage." He says he knows the larger community, including the inner city and would welcome the opportunity to head the new district, even if it ends up being shorn of the suburban areas that formerly made up SCS. "I adopted a disadvantaged kid, whose parents had been evicted from a housing project in Memphis. My wife works as an intensive-care nurse at the Med. We understand that community." Aitken says he understands the need for a search process, even an extended one, if need be. "I'm not opposed to that. If I'm not chosen, I've got to look at every opportunity. I'm willing to be an assistant." But the ex-athlete and coach concedes, "There's a little competitive streak in you. You want to make things right. And you want to win." Aitken has followed the deliberations of the TPC and the turns of state educational policy with great care. He knows that the "Multiple Achievement Paths" model will involve great complexity and that the process of educational innovation will continue. He hopes that the new district in Shelby County becomes a model for the rest of the nation. But his ultimate premise is this: "There's much that comes and goes, but what's constant is that one teacher in front of that kid in every classroom."